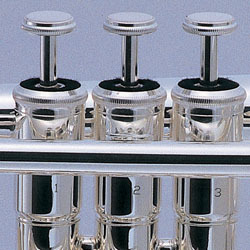 J. Michael brass and woodwind are ideal educational instruments. J. Michael offers a comprehensive range of trumpets, trombones, saxophones, flutes and clarinets that will take a student through the graded examinations and beyond. They are popular with players and teachers in the UK. Our aim is to supply fine quality at great value prices. Production of J. Michael is supervised by qualified instrument makers and all instruments are carefully inspected before being shipped. We believe that design is one of the most important factors to produce good instruments and J. Michael instruments are designed and developed by skilled Japanese technicians, using the latest technology to achieve high standards. Each instrument is also individually checked before dispatch to ensure that it arrives in perfect condition. We spend time on our quality to ensure that J. Michael instruments have the essential features of good intonation, easy response and good playability. All J. Michael saxophones feature high quality keywork, full rib construction, high quality blued needle springs and metal resonator pads for a better sound. They are supplied with cleaning cloth, cork grease, gloves and neck sling. Stentor Music Co Ltd is the UK distributor for J. Michael instruments. Request a copy of the J. Michael brochure with full details.